The Black Magic Sausage is based flavor wise off of my Black Magic Dust, which is the flagship of my spice or, should I say, “dust” line. It’s a Southern BBQ influenced sausage seasoned with smoked paprika, confit garlic, Dr. Pepper reduction, and finishes with a subtle kick from fermented jalapenos. The Black Magic Sausage is a very well balanced sausage with a few Black Magic nuances and different takes on ingredients we’re all familiar with. 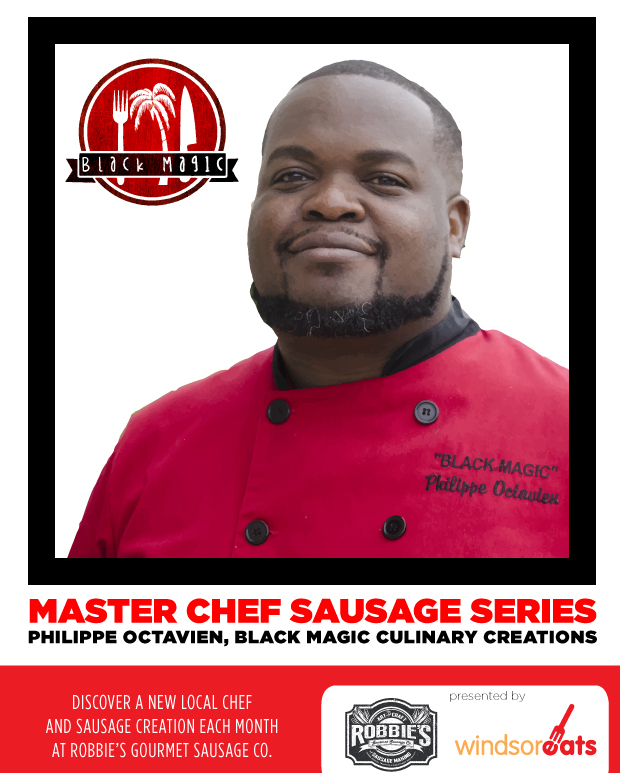 I am the chef and owner of Black Magic Culinary Creations, which is a mobile to you catering company specializing in pop ups, private events, in home dinners, and customized menus. I’ve been cooking professionally for 9 years now. Two of those years were spent cooking in New Brunswick where I can say I started to develop confidence and come into my own as a chef. My most recent restaurant job was at The Twisted Apron where I worked for 3 1/2 awesome years as Sous Chef. Now I’m #SharingTheMagic with Black Magic Culinary Creations by bringing great food together with great people. I would have to say my biggest culinary influence would be the first chef I apprenticed under: Marty Atkins at Bin 151. His commitment to excellence, attention to detail, and absolute love for cooking is something I carry with me to this day. “Your only as good as your last dish,” is what he would always remind me. It was never a competition with others, it was always a competition with yourself to try and top yourself every time. He also encouraged me to be true to myself as it pertains to cooking. Blaze your own culinary path, push new boundaries, try new things and don’t be afraid to fail. He affected me more than he will ever know. I thank him then and now for taking a chance on a very green chef who just wanted a chance to learn and grow. Thank you, Marty Atkins. I basically wanted to have my Black Magic Dust turned into a sausage. These are flavors that represent me and what I do, so in essence it’s me in sausage form. I wanted to taste it and immediately think Black Magic. And with the help and expertise from Robbie of Robbie Gourmet Sausage Co., we were able to do that. I couldn’t have been more impressed with how it turned out. It would depend on the day. I have a very eclectic background, food wise. I am a Haitian who was born in the Bahamas, who moved to the States at a young age and then Canada as a young adult, where my professional culinary career began. Smoked paprika, toasted coriander, furikake, thyme and tomato powder are just some of the spices that I love. I know which spice I hate. I hate cumin. 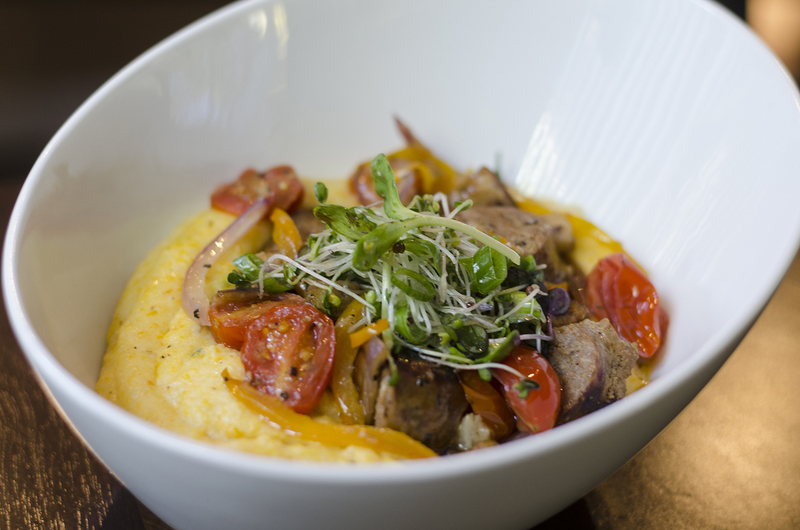 These Autumn grits will warm up your body and soul. This recipe for Black Magic Sausage Ragu with Autumn Grits will keep your body and soul warm through the colder months.